By default, Wordpress uses the wp_enqueue_style and wp_enqueue_script functions to handle CSS and JS files. In Mouf, on the other hand, scripts and styles are handled using WebLibraries. When you use Moufpress, you can use both techniques to add JS and CSS files to your pages. If you want to add JS/CSS on all pages of your Wordpress site, including the pages not managed by Moufpress, you should do this the Wordpress way. If on the other hand, you want some JS and CSS specifically on the dynamic pages handled by Moufpress' controllers, you should declare a web library. We will not cover the use of web libraries in this documentation. If you want to learn how to use we libraries, please refer to the web libraries documentation. Internally, the Moufpress plugin is replacing the default renderer that comes with the WebLibrary system by a custom renderer that is tailored specifically for Wordpress. In Mouf, you can search for the defaultWebLibraryRenderer instance, and you will see that this instance points to a WordpressWebLibraryRenderer class. 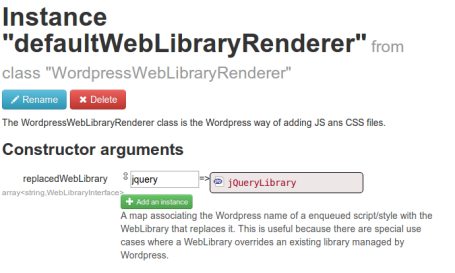 This means that the WebLibrary system will use Wordpress to render JS and CSS files. At some point, you might have a Wordpress plugin that declares a JS script in Wordpress and a Mouf package that declares the same JS script in Mouf. Of course, you want to avoid loading the JS script twice. Moufpress let's you do this. In Mouf UI, open the defaultWebLibraryRenderer instance page. As you can see, there is a replacedWebLibrary property. This is a map where the key is the name of the script as declared in Wordpress and the value is the WebLibrary that will replace it. By default, you will notice that Moufpress is replacing the jquery script with its own version of the script.